Phnom Penh residents who have been unable to find their names on the voter list may be left out of Sunday's election, as commune officials and the National Election Committee are struggling to locate missing names. Deep-fried arthropod-eating enthusiast Ly Vibol pointed at the mound of crickets in Phnom Penh as they were scooped into a plastic bag. An investigation by French police into the murder of a 25-year-old French tourist in Kampot province in February has failed to produce any DNA evidence that could identify her killer, an Interior Ministry official said Tuesday. As mobile rallies of the ruling CPP and the opposition Cambodia National Rescue Party have passed each other on the streets during the lead-up to Sunday's election, their confrontations could be taken from the script of "West Side Story." Cambodia National Rescue Party president Sam Rainsy on Friday vowed to write a new page of Cambodian history in next week’s election in his first speech after returning from four years of self-imposed exile. Half of Cambodia’s garment factories monitored between November and April are “chronically non-compliant” with the Labor Law and the industry has experienced deteriorating working conditions and fire safety records in the past three years, ac­cording to the latest report from the International Labor Organization’s (ILO) factory monitoring program. When the National Assembly forms after this month’s election, Pen Sovann—Cambodia’s first prime minister after the fall of the Khmer Rouge in 1979, and a man imprisoned in Hanoi between 1981 and 1991—may well be seated close enough to stare down the man who he believes betrayed him three decades ago. Thai Prime Minister Yingluck Shinawatra and her Lao counterpart flew into Cambodia on Tuesday to pay their respects to Prime Minister Hun Sen’s late father, Hun Neang, an official said. The Ministry of Education is preparing to distribute questionnaires nationwide to assess the gap between the job market and subjects being studied by university students. Hun Neang, the elderly father of Prime Minister Hun Sen, died in the early hours of Friday morning at the age of 89, government officials said. 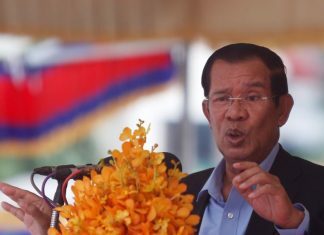 With just over two weeks to go before parliamentary elections, more than 150 complaints have been made over violations of the country’s campaign laws, about 60 percent of which have come from the opposition Cambodia National Rescue Party (CNRP), according to National Election Committee (NEC) officials. The National Election Committee on Thursday released the results of an internal audit of its voter list and found that 9 percent of people registered to vote on July 28 could not find their names on the list. The National Election Committee will today release the results of an audit of its own voter list, which it ordered after two other independent audits found the list to be pitted with irregularities that could leave up to 1 million registered voters un­able to cast their ballots on July 28. A $300,000 sum to repair Siem Reap City’s fire-ravaged Doeum Kralanh market, originally billed on Monday as a donation from Prime Minister Hun Sen, will actually be taken from the national budget, according to a senior ruling-party official. About 30 former residents of the Boeng Kak community submitted a petition on Friday morning to the World Bank office and several embassies in Phnom Penh, calling for a halt to all funding for longtime anti-eviction protesters from the Boeng Kak area. Cambodia National Rescue Party election candidate Mu Sochua campaigns in Battambang province this week. Until recently, residents say, most of the former Khmer Rouge in Battambang's Samlot district did not care much about events outside the area, and now, more have started to support the opposition--even if their homes bear campaign stickers for the CPP. Residents of three villages in Kompong Cham province’s Krala commune are growing increasingly frustrated with problems caused by a local garbage dump, saying it is a health hazard and that it emits an unpleasant odor. National Election Committee (NEC) Secretary-General Tep Nytha yesterday defended an order banning NGOs from holding meetings with villagers in Ratanakkiri province during the election period, saying that such meetings would prevent people from missing out on important campaign messages. As the ruling CPP’s campaign juggernaut snaked through the streets of Phnom Penh on Thursday in a breathtaking display of vehicular wealth and membership might, the little-known League for Democracy Party (LDP) started their election bid with their sights, and expectations, set very low.